Beatles Signed ephemera is our specialty at www.Beatles4me.com. 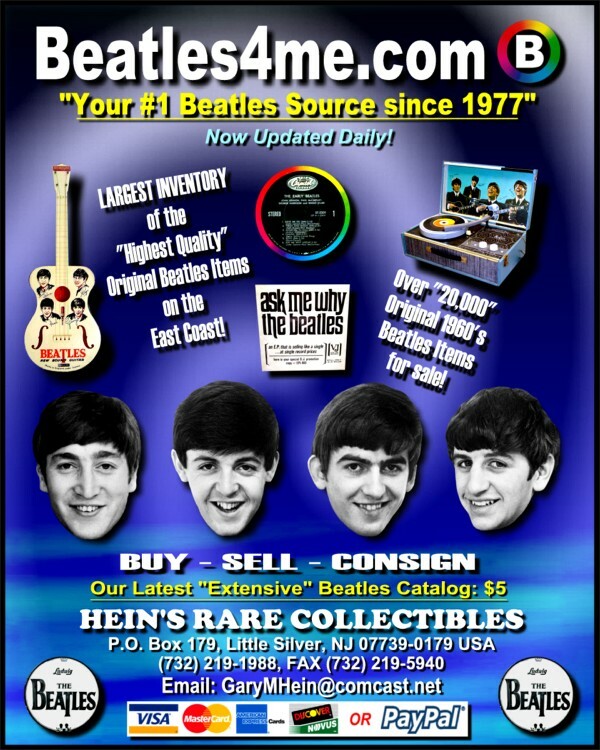 We are the ONLY Dealers who offer not only 2 Letters Of Authenticity (LOA's) (World-Renown Beatles Expert: Frank Caiazzo AND Owner of www.Beatles4me.com: Gary M. Hein) but ALSO include a 100% LIFETIME Money-Back Guarantee that the Beatles Signed ephemera that we offer are 100% Authentic, Real & Genuine in every aspect! Again, NO OTHER DEALER offers this type of Guarantee! We offer only the Best, what you have come to expect from www.Beatles4me.com, Your #1 INTERNET Beatles SOURCE!!! Remember, Original, Genuine & 100% Authentic Beatles Signed ephemera are our specialty at www.Beatles4me.com. As time permits, we update our website with new Beatles Inventory as it is received. Also don't forget, we Buy & Sell Original Beatles Records, Beatles Memorabilia and Beatles Signed ephemera. Click the link above and come see our "Extensive" Beatles Website, where we list our Authentic Beatles Signed ephemera!! !